One year ago today I started chemotherapy for breast cancer. 23 years ago today I finished chemotherapy for Burkitt’s lymphoma. Over the last year, my full-time job has been caring for my body. I have doctor’s appointments most days, followed by eating well and exercising in hopes that I will get more time on this earth. I’m also working on my message. I want to be an inspiration to the many people who have been there for me. Recently I heard a song for the first time called “Overcomer” by Mandissa which is all about thriving in spite of adversity. I felt like this song was written for me. Here’s the video. We all have adversity in our lives. I’ve certainly had my share. I’ve learned to embrace it and try to see what lessons I’m supposed to learn. What wisdom can I gain? Yesterday I had the opportunity to celebrate with my friend, Gina. Our daughters brought us together 10 years ago and Gina battled breast cancer in 2009. When I found out I had breast cancer last year Gina was immediately by my side encouraging me to be an overcomer. Gina has always had a dream of opening her own personal training studio. In March, her dream came true. Her focus is on helping women become the best version of themselves. She’s even offering free classes to women with breast cancer. Gina is also an Overcomer. Here’s her story. Gina and I at her studio in Mesa. For me, overcoming is all about surrounding myself with those who love and encourage me. And those who are my encouragers are you! You give me a reason to put both feet on the floor and then one foot in front of the other. Some days I just have enough energy to put one foot in front of the other and make it just to my kitchen. But other days, I’ve been able to climb mountains. 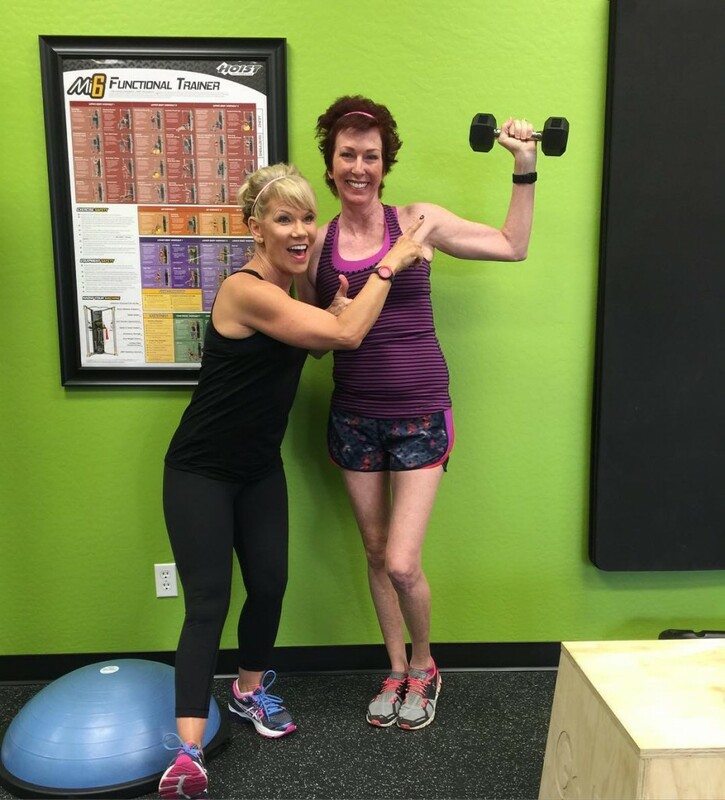 This is my friend Lisa who has been battling valley fever and she is also a conqueror of Rheumatoid Arthritis like I am. Because of her RA, Lisa hurts all over and struggles to breathe. 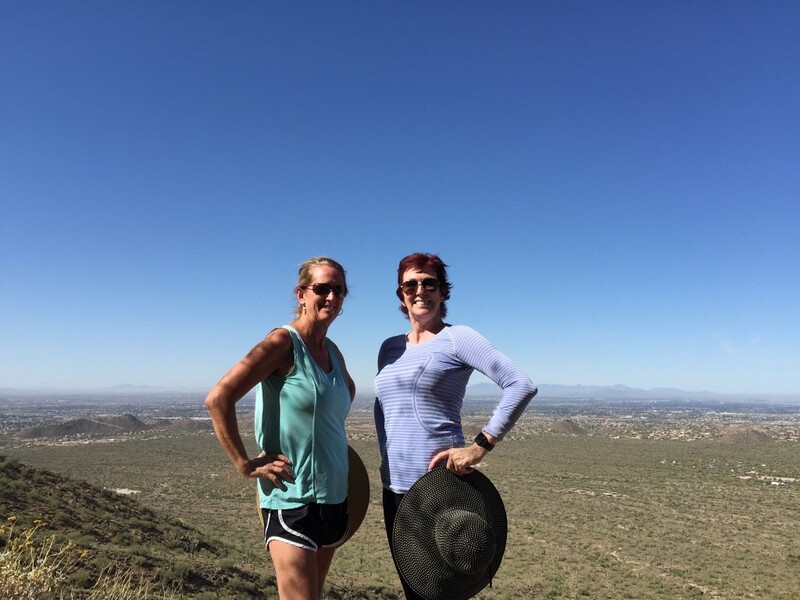 But yesterday she climbed a mountain with me, when we both hiked up to Usery Mountain’s Wind Cave in the Superstition Mountains. Lisa is an Overcomer. Lisa and me at the Wind Cave! I’ve received 3 different spinal epidural procedures for my degenerating discs since January. 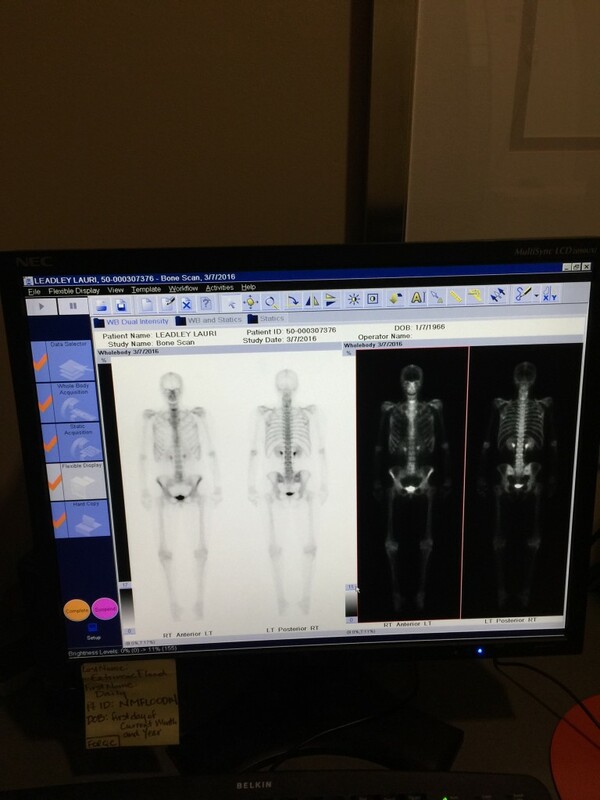 They even had me do a bone scan to rule out metastasis to my bones. 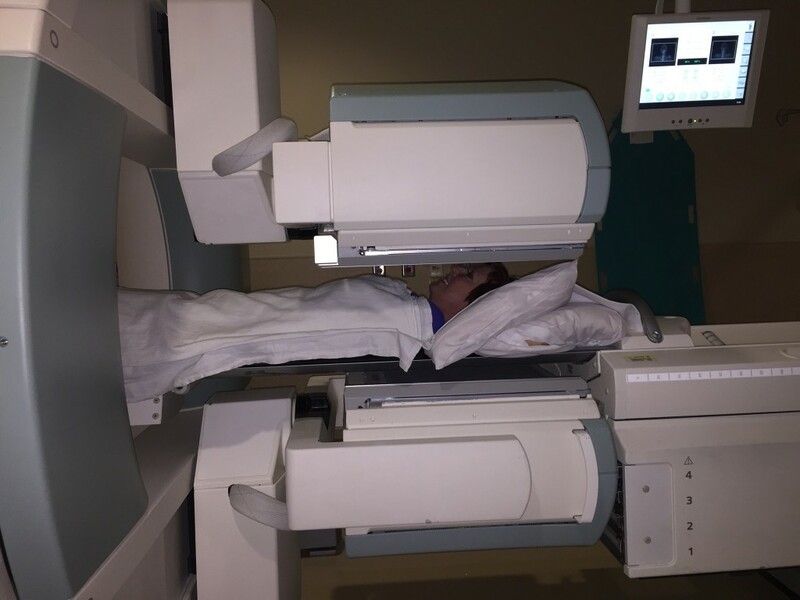 Bone scan.. This is what I spend my days doing. Guess what? The most recent procedure confirmed; there is no cancer in my bones! No cancer in my bones! My victory was the medial branch block procedure which consists of 4 needles into your spine without sedation so I could tell if it worked right away. Well, I think it worked. Today I am an overcomer because I know that back bending is good for your body and today was the first time that I was strong enough to do it in over a year. So my message of encouragement to you today is; don’t let your adversity get the best of you. Stay in the fight until that final round. I am reminded of my colleague and friend Dr. Ahmed telling me a year ago, “Lauri you will be victorious.” Well today I felt the victory even though I’m not quite to the finish line because I have two more treatments. In reality, though, my finish line is the day I leave this earth. 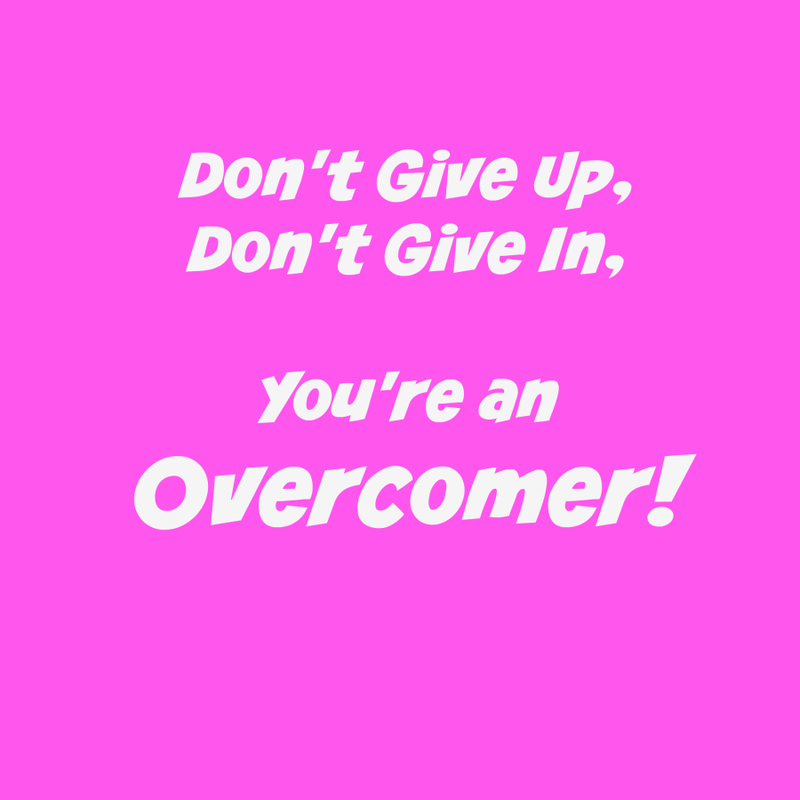 Don’t give up, don’t give in; You’re an overcomer!